This is a scaled claim. Wikipedia is a free-content encyclopedia that anyone can edit. By the 2005/01/26 it had 458,147 articles in its english version. Read What is an article for the definition of an article. 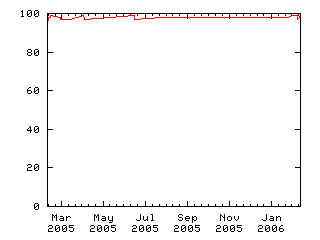 The claim will pay 0.00 (zero) if en.wikipedia.org will not have 1.000.000 (one million) articles before GMT 00:00 of 2016/05/01. It will pay 1.00 if the claim will be true before GMT 00:00 2008/02/01 (January 2008 or before). It will pay 0.01 less of 1.00 for every month after this date, accordingly with the following table. On 10 March 2006, the statistics page showed that there were 1,015,543 articles. Therefore, this claim can be judged early at 1.00.